The games were meant to showcase Brazil’s arrival on the world stage as a modern powerhouse after a decade of expansion that established a strong middle class. Instead, Brazil has come under criticism from FIFA, soccer’s world governing body, for delays in readying its stadiums, and the country is struggling to provide enough hotel beds. 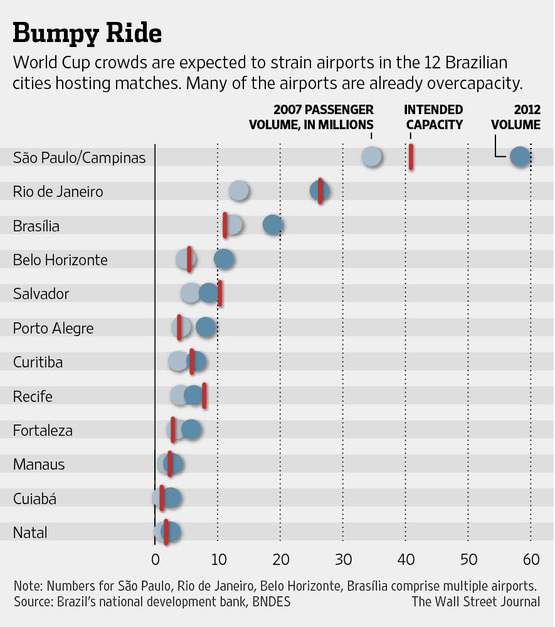 Among the worries piling up over Brazil’s preparations for the World Cup soccer tournament in June is a new one: air transportation. As you can see from the list, the venues are thousands of miles apart; Manaus is 2,700+ miles from Rio. An estimated 600,000 World Cup fans, twelve cities, a cumbersome bureaucracy, a slow-moving judiciary and a lack of imaginative planning. What a mess. Granted, traveling around Brazil is a challenge, even for most ‘Brasileiros’, as we’re not talking about a country, but a giant of a Continent!, but the fact that the competition is spread out, can only mean that all cities will cope. Lastly, I add, that having lived in BR for over 20 years, I have no doubt that the charm of its people and amazing locations will more than make-up for any shortcomings.